This sanctuary is located at a distance of 43 km of Somnath, 65 km of Junagadh. Established in 1965 it covers a total area of 545 sq miles out of which 100 sq miles is protected area. It is a deciduous forest interspersed with semi-evergreen and evergreen flora, grasslands and rocky hills. It has lot of water bodies spread across all over the park. It is the only abode of Asiatic lions on the last count they were approximately 523 in numbers. It was once the hunting grounds of the Nawabs of Junagadh until it was declared as protected area in 1900 by Nawab Sir Muhammad Rasul Khanji Babi. Before being declared as protected area the count of lion had come down to as low as 20. 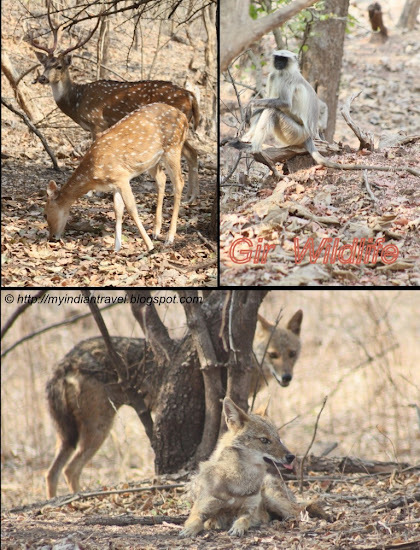 Apart from the lion other wild life found in this forest are leopard, deer, four horned antelope, Jackal, Striped Hyena, Jungle and Rusty-spotted cat, Langur, Porcupine, marsh crocodile. The forest is known to have around 250 species of birds. Rare species such as Lesser Florican and the Sarus Crane are seen in the grasslands of the sanctuary. We reached this place from Diu around 10 in the morning. We had to wait in the queue to get tickets for the jeep Safari to go around the forest. There are lot of online sites where one can book the safari, but it is difficult to identify the genuine sites. Hence we booked the tickets for safari in person. More on this soon. Great wildlife and a huge territory. Quite an experience you had! A great wildlife experience ... It's wonderful that they saved the Asiatic lion from extinction. what a wonderful place to visit. Thank goodness for protected areas! Fabulous shots of the flora and fauna; loved the lion photos. So happy to read it has been made a sanctuary for them. Interesting post.....lovely photos.....thank you Rajesh! so many wild animals ! some nice captures, Rajesh. esp the lion shot. good one. It looks like you really had an adventure at the safari. Wonderful to see the animals in their natural habitat. What a beautiful sanctuary filled with amazing animals! What a wonderful adventure, Rajesh. I return to India in May, after a transatlantic cruise from Tampa, with five days in Barcelona at the end...my first cruise in six years. For the first time, a friend will do this trip with me...the cruise and she will stay a whole month in India with me. Rajesh...That is sososo sad about the number of lions. People have no respect for nature and how easily species can be sent into extinction because of there non-caring. Your photos are so pretty, and I really like the way your collage turned out. So nice. Great captures, Rajesh, as always and it does look like a FUN day!! I hope you have a great new week!! Amazing to see these animals in the wild, I'm glad the lions are now protected. Great!I went to the park and did not see a single lion but a wonderful male leopard instead. I hope that the number of lions will not dwindle and that they will be protected. chai-and-chardonnay.blogspot.com: Wow! good you could see a leopard. It is rarer than lion with very minimal chance to spot on. You are lucky. Bom dia, fotos maravilhosas da vida que faz parte do planeta. Wow, very cool to see the wild animals and the beautiful birds. I would like to go on a safari. Great photos. Lovely photo's Rajesh! 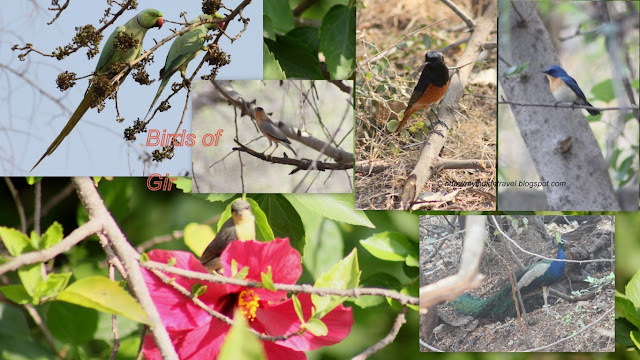 It must have been a wonderful wildlife experience to see all these beautiful creatures in this Sanctuary. A great post, - love the animal photos. I worry about our wildlife. I'm glad there is a refuge and that the lions have survived and grown in numbers. Those birds are exciting!!! Glad they've preserved land for the lion herd! What an awesome wildlife refuge - it must be incredible seeing lions like that. Beautiful animals, great photos and a nice narration, Rajesh. The reduction in the number of Asiatic Lions (as with any other species killed for the sheer pleasure of dominance, in cowardly ways), is sad. I am happy that a law was passed to protect these lovely animals. It's wonderful to see that so much is being done to protect animals in the wild. Sounds a wonderful place and a must for any bird lover. Nice to hear a success story of conservation of wildlife. These surroundings are so serene and calm. Thanks for this post, Rajesh! An amazing area with lots of wildlife. I love the lions. Wonderful to see wildlife wandering and flying free. Looks like a fascinating park. What a beautiful sanctuary filled with amazing and dangerous animals !! wow !!! amazing place, thanks a lot for sharing. I have never seen Lion in the Jungles, always in the zoo :) So happy that I could it through your blog at Gir!